President Obama announced he was rejecting the Keystone XL pipeline project Wednesday, blaming Republicans in Congress for forcing him to make a decision. The pipeline would have transported up to 830,000 barrels of oil per day from Alberta, Canada to Oklahoma and Texas. Below is a comprehensive timeline of the project, providing details about major actions over the past 40 months from the time the State Department first received the application. Sept. 19, 2008: The State Department receives an application from TransCanada to build the 1,700-mile Keystone XL pipeline, and announces that it will conduct an Environmental Impact Statement (EIS). Jan. 1 – June 1, 2009: State conducts 20 “scoping meetings” to explore the issues that should be addressed in the EIS, and consults with federal and state agencies and Indian tribes impacted by the pipeline. April 16 – Sept. 1, 2010: The department solicits comments on the proposed pipeline, twice extending the comment period due to the volume of submissions it receives. After receiving nearly 1,800 verbal and written comments, State ends the comment period at the request of federal agencies. June 2010: Meetings held in Texas and Washington, D.C., in response to public comments. Sept. 14, 2010: The International Brotherhood of Teamsters and the International Union of Operating Engineers endorse the pipeline, marking the beginning of a rare political alliance that pits supporters of increased energy production and labor unions against environmental groups. Oct. 15, 2010: Asked about the Keystone XL pipeline at the Commonwealth Club of San Francisco, Secretary of State Hillary Clinton says “we are inclined” to approve the project. Oct. 25, 2010: The general presidents of four major labor unions representing more than 2.5 million workers urge the State Department to approve the pipeline. Dec. 7, 2010: State hosts meetings between Indian tribes and federal officials in Washington to address concerns about the pipeline. Jan. 1, 2011: TransCanada, Keystone’s parent company, agrees to 57 safety measures relating to the construction, operation and design of the pipeline. The measures were a joint creation of the State Department and the Pipeline and Hazardous Materials Safety Administration. March 6, 2011: In a show of bipartisanship, Democratic Sens. 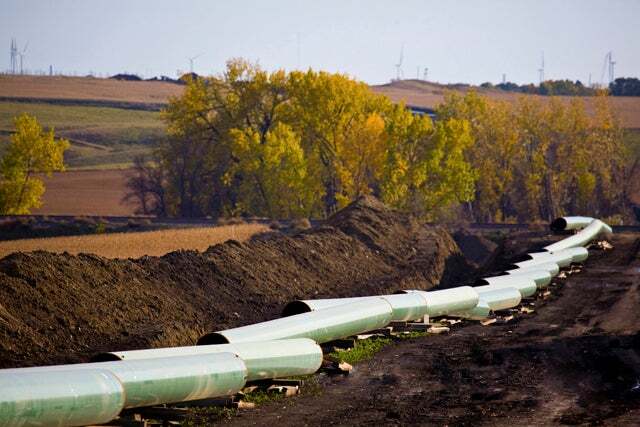 Mark Begich (AK), Mary Landrieu (LA), and Max Baucus (MT), join 11 of their Republican colleagues in endorsing the pipeline. “Now more than ever, it is critical that this country move forward with this project,” they write in a letter to Clinton. April 15, 2011: State releases a supplemental draft EIS, which, it notes, “does not alter the conclusions” reached by its initial statement a year earlier. April 15 – June 6, 2011: State opens another comment period following its supplemental draft EIS, soliciting a whopping 280,000 public comments. May 23, 2011: Rep. Lee Terry (R-NE) introduces the North American-Made Energy Security Act, which would force the president to make a decision on the Keystone pipeline by Nov. 1, 2011. July 25, 2011: The White House releases a “Statement of Administration Policy” calling Terry’s bill unnecessary, since State “has publicly committed to reaching a decision” before year’s end. July 26, 2011: The House passes Terry’s bill by voice vote. It never receives Senate consideration. If unable to import oil through the Keystone pipeline, Canadian producers would simply seek other customers using alternative methods of transportation. Aug. 26 – Oct. 9, 2011: State conducts its National Interest Determination, soliciting public comments and holding meetings in six states and Washington, D.C.
Nov. 10, 2011: President Obama announces he is delaying the project “in light of additional information gleaned from consultations with Nebraska state and local officials as well as public comments.” Citing concerns over the pipeline’s effects on the Sand Hills region, Obama questions whether the pipeline “is in the national interest.” The president makes clear that no decision will be made on Keystone before the 2012 election. Nov. 14, 2011: TransCanada announces that it has reached an agreement with Nebraska officials on an alternate pipeline route through the state, which avoids the Sand Hills region. Nov. 22, 2011: Nebraska enacts a law codifying a process for approving the route and directing the state’s Department of Environmental Quality to cooperate with State in moving it forward. Nov. 30 – Dec. 15, 2011: Keystone receives support from numerous Senate Democrats, including Baucus, Jon Tester (MT), Kent Conrad (ND), Claire McCaskill (MO), and Joe Manchin (WV). Dec. 13, 2011: Steel pipe manufacturer Welspun Tubular announces that it had to lay off 60 employees as a result of the delays in permit approval for the Keystone pipeline. Dec. 23, 2011: The House and Senate unanimously approve and Obama signs the payroll tax bill, which requires the president to approve or deny the Keystone permit within 60 days. Jan. 18, 2012: Obama announces he is denying the Keystone XL permit, and cites inadequate environmental examination. Jan. 19, 2012: Reports indicate that Canadian Prime Minister Steven Harper is looking to sell crude to China in light of Obama’s Keystone XL rejection.